The ability of the camera to capture beauty and tell stories presented irresistible opportunities for many fields of research at the start of the twentieth century, including for ethnography, the study of people and cultures. Here was a tool to capture what the eyes of voyagers would marvel at as they explored exotic contexts rarely witnessed by Europeans, if not by conquerors - a tool which had the potential to challenge the perspectives set up by these colonizing powers. This gaze may be recognised in the work of two pioneering filmmakers featured in the Documents and Documentaries strand of this year’s edition of Il Cinema Ritrovato: Voyage au Congo (1927) by Marc Allégret, and the ethnographic films of Marquis Robert de Wavrin, explored in a new documentary by Grace Winter and Luc Plantier, Marquis de Wavrin. Du Manoir à la Jungle (2018). Marc Allégret travelled to what was then French Congo in 1927 with his lover André Gide, who was writing a book about the trip. The countryside is portrayed as a kind of paradise, with lingering shots of sunlight sparkling across the river and idyllic scenes of families going about their mornings. “Nothing is more peaceful than life in one of these villages,” one title card reads. 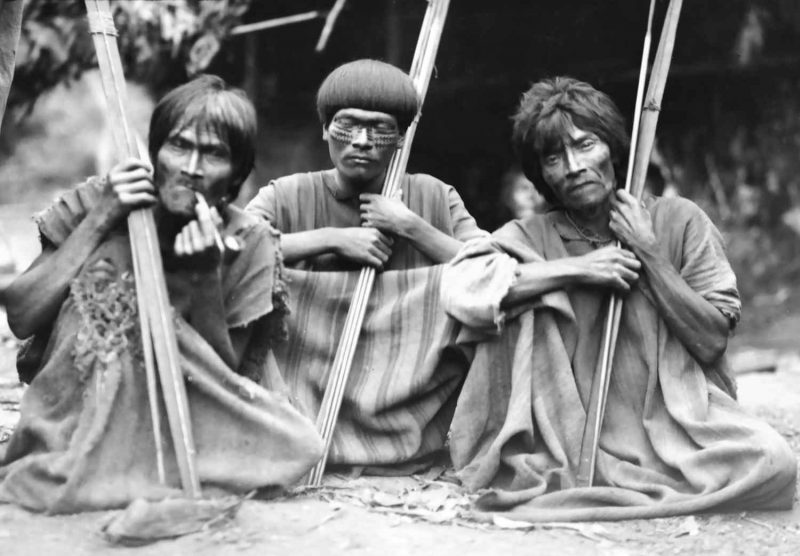 In this same period the Belgian Marquis Robert de Wavrin made several trips to South America, venturing into the Amazon rainforest and the remote Andes, living among tribes and filming their day-to-day lives. He wrote in his diaries that he would “much rather sleep in an Indian hut”, among those who were “naked like gods and free like the wind”, than in any hotel. For both expedition parties relied on native people as their guides, cultivating friendly dynamics with their hosts. The Marquis de Wavrin appears in front of the camera often, sitting among tribespeople, talking and puffing away on a pipe that earned him a reputation as a white sorcerer. Even when he is not sharing the screen space with his new friends, they would gaze back into the camera with an amused grin which suggests complicity. A similar comradery is occasionally suggested in Allégret’s Voyage au Congo. In one sequence he strays away from his observational documentary style, staging a love story between two young members of the Saras tribe, Kadde and Djimta, in order to demonstrate the local rituals of courtship and marriage. These scene are also intended to make the Saras people relatable to a European audience - they too flirt and bicker. Local architecture is also regarded as worth documenting by these ethnographic filmmakers. Allégret is particularly interested in conveying the variety of living quarters, such as the impressive shell-like mud huts of the Massa tribe. These are accompanied by intertitles detailing how they are made. Here too there is an intention to show respect towards the lifestyle of the Massa: “The Massa share with their cattle the inside of their hut which is nevertheless very clean because everything has its proper place.” The Marquis de Wavrin’s curiosity for how the Arawak constructed their bridges reportedly earned him the respect of a tribe chief, as they recognised each other as equals. Grace Winter, who led the archival research for Marquis de Wavrin. Du Manoir à la Jungle, explains in the commentary of the documentary how the Marquis de Wavrin’s genuine interest in basic everyday activity makes him stand out from other ethnographic filmmakers of the time who instead focused on highlighting the differences between indigenous people and the white civilised man, thus reinforcing colonial propaganda. The respect in Allégret’s gaze is however sometimes more problematic. In Voyage au Congo we observe a ‘tam-tam’ dance ritual, during which the camera keeps closing in on Djimta’s gyrating naked body. This exotic spectacle recalls Josephine Baker’s performances, a connection that audiences in 1927 may also have made and therefore accepted as in line with their understanding of sexualised black bodies. The odd patronizing comment in the intertitles, including about Djimta’s ‘naïve movements’ as she acts her part pining for Kadde, can also be interpreted as reiterating the primitive nature of indigenous people. Wording also posed problems for the Marquis de Wavrin. His film Venezuela Petite Venise (1937) was originally entitled Venezuela, ses hommes et ses paysages, but this provoked an angry letter from the Venezuelan embassy in Paris, who felt that the title misled audiences into believing that the whole of Venezuela was an uncivilised country. Although the politics of representation in ethnography have since moved on, in the early twentieth century the works were undoubtedly groundbreaking. The Marquis de Wavrin was the first to capture on film a Tzantza head-shrinking ceremony of the Jivaro tribe in Au pays du scalp (1931). In Voyage au Congo, a young man entertains his little brother by playing with a baby crocodile on a lead. These extraordinary scenes would have been the first to depict indigenous people and their ‘savage’ ways within a framework which that promoted their approachability, albeit still exoticised. In their writings, the Marquis de Wavrin, Allégret and Gide explicitly denounced colonialism and racism. In their images, though more implicitly, they celebrate equality in the beauty and adventure of ethnographic research.